Blondie and Brownie: Happy Halloween! Go Get Some Pumpkin Goodies!! Happy Halloween! Go Get Some Pumpkin Goodies!! Serious Eats: New York has been doing pumpkin-themed Sugar Rushes for a few weeks now and the delicious looking desserts have made my pumpkin CRAVING worse every day. Just as I think I'm over it, pumpkin cheesecake or pumpkin & spice cupcakes bring it back tenfold. I needed some relief, to a bakery!! I've been to Billy's Bakery before, but wasn't impressed. Their selections seem somewhat mundane for me, nothing really warrants a trek over to the heart of Chelsea. From what I did eat from there, it wasn't going to become my favorite, therefore if I'm going to make a point of visiting a bakery, I'd rather haul my fat booty down to the Sunshine love. 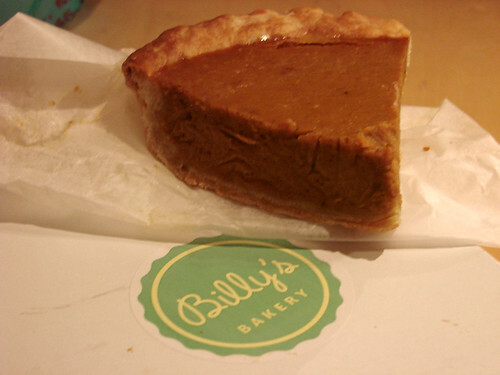 With all this in mind, I stepped inside Billy's again, partly to escape the rain and wind on Monday night, partly to hope their pumpkin goodies would make me being on 9th Avenue worth it. First, I inquired about the pumpkin 'bar' with cream cheese frosting, which went from having 'no nuts' to 'just nuts on the frosting' to 'oh, there may be some nuts inside, but not many.' Yes, I had to coax these answers out of them. 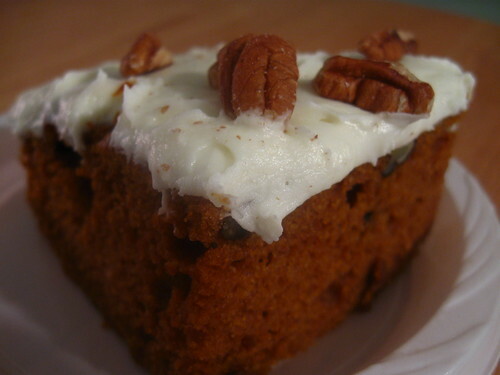 In reality, it's pumpkin pecan sheet cake. But, was it worth it? Kind of. 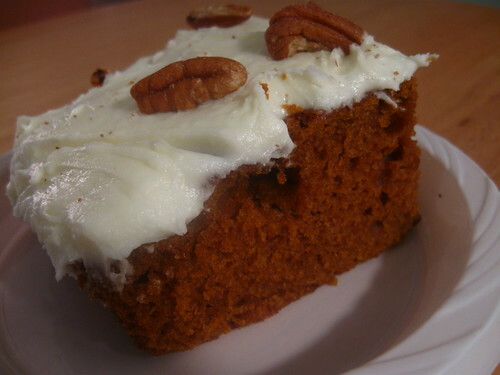 Mommsie and I failed to really taste the pumpkin, it was more like spice cake. So, if passed off as spice cake, it would have been very good. The cake itself was moist and fluffy, while the frosting was sweet and creamy. The other pumpkin treat I spotted was pumpkin pie. I saved some for the next day believing it didn't contain any nuts, but Brownie wasn't going to take a chance after hearing about the first treat, leaving all the tasting duties to me and I'm by no means a pumpkin pie expert. It was full of pumpkin flavor and had a good amount of spices, but the texture was off, it was almost like the inside of a bad french fry. Not grainy because there were no hard parts, but definitely not creamy. Space Smells like Steak...Who Knew? The Vendys are Almost Here! Shin Ju II is Now Open! 45 years of Amazin' and WTF Mets, W.T.F? !